** 2-CD Set, shipping on backorder ~ one week ** Click here for more details. ** Digital MP3's for immediate delivery! ** Click here for more details. ** Digital MP3's for immediate delivery! PLUS 2-CD set to keep or share. Save!! ** Click here for more details. The book on why addiction happens, how to identify whether y ou are addicted, and what to do about it. It has taken the addiction world--and addiction prevention world--by storm. There is no other book like this, which describes who gets addicted and more importantly WHY, on the market. 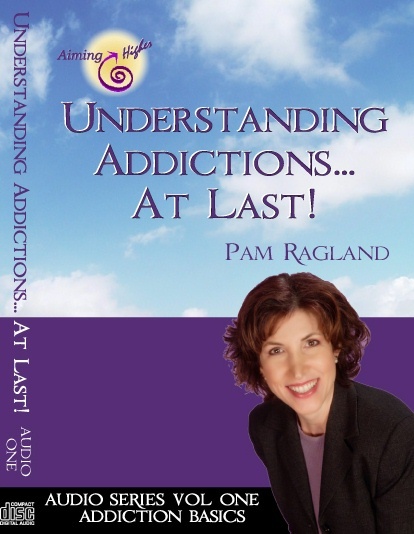 Learn about Pam's 3 Keys process to remove addictions, and how her innovative Thought ShiftingTM process plays a huge part. ** Digital Ebook for immediate delivery ** Click here for more details. Are you hurting your loved one(s) by accident, even though you mean well? How do you stop and prevent "co-dependent" behavior? How can you keep your loved ones and friends from draining your energy? This audio program (over 4 hours of audio) and mini action guide book answers all these questions. I have learned the hard way, by Caretaking my own addicted family, how to identify this and how to stop it. There is nothing else like this available today. Help your loved ones instead of hurting them, and stop feeling drained emotionally & financially, by learning now what I learned the hard way over decades!! ** Digital MP3 Audio & PDF E-book for immediate delivery ** Click for more details.